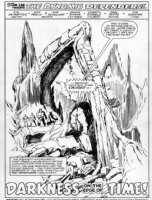 PERLIN, DON - Marvel; Ghost Rider, Defenders, etc. PERLIN, DON - Defenders #121 cover, the entire Defenders try to defeat the Miracle Man! PERLIN, DON - Ghost Rider #34 page 10 full splash page Ghost Rider battles his psychic enemy. PERLIN, DON - Ghost Rider #39 page 30, last page, Ghost Rider rides his Flame Cycle of into the sunset. PERLIN, DON - Ghost Rider #46 page 23 half-page splash of Ghost Rider busting thru floor to terrorize a group of bad-guys.